PGF Week 7 was Fall Break at Ball State University. PGF regrouped this past week—Week 8—in order to reconsider how our exercises met academic standards. Throughout this process we are ensuring that each of our activities is connected to specific standards in other academic fields—such as English or Math—so that a K-3 teacher can easily integrate our system into their standard curriculum. The low-fidelity model currently in place uses Indiana elementary teaching standards. We are researching the federal standards put forth by the U.S. Department of Education for the final prototypes. 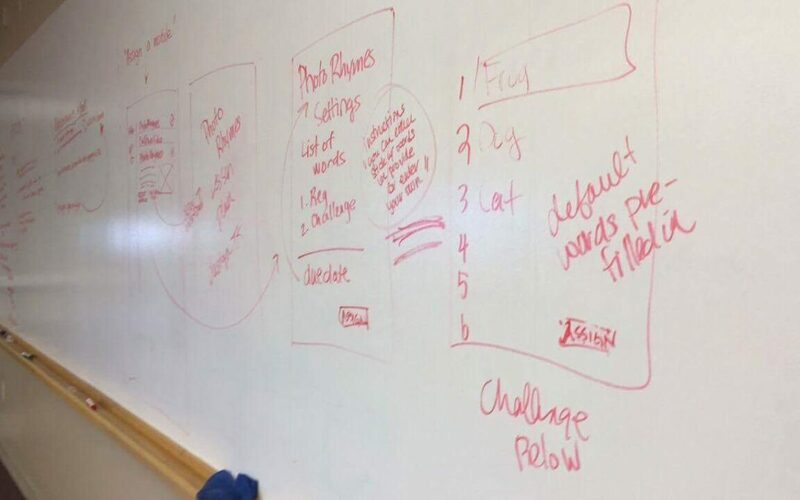 This past week, we also brainstormed how the navigation of the activities might work. We have a number of prototypes on how a student will be able to navigate between steps of an exercise and the easiest and quickest way for them to access the tutorials in the system. In the following weeks we will be improving upon all prototypes and working on new prototypes for the navigation on the teachers’ side.